Love this glam look by Michael Kors! 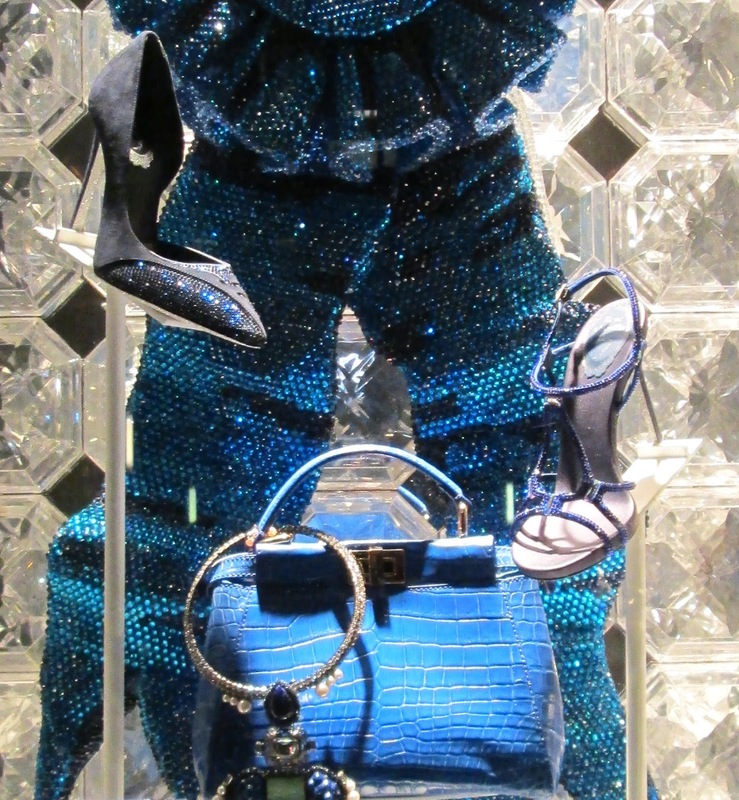 I know it is now January, but I couldn’t resist doing one more post on the holidays windows at Bergdorf Goodman from the Fifth Avenue side of the store, especially since I still have sequins and jewelry on the mind (okay it’s true, I always do). I’m not the only one though, don’t forget the awards season is upon us starting this Sunday night with the Golden Globes! The smaller windows on Fifth Avenue were the only place where the focus was actually on clothes and accessories and not so much the scenery, as with the other bigger windows. All of the windows were a collaboration with Swarovski crystals and the smaller windows didn’t lack for shimmer even though there was less space to use! Love the sparkly shoes and the bag (Fendi, I think). All about the silver sparkle. 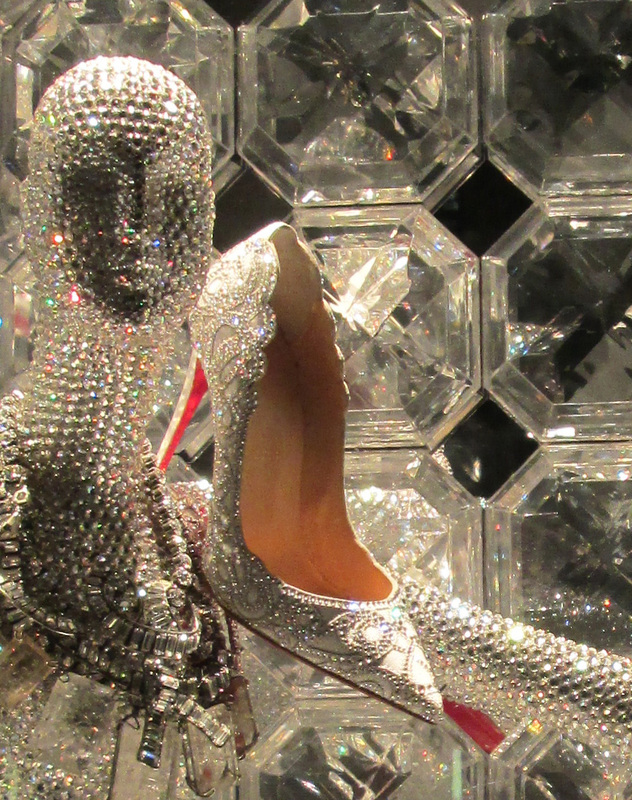 I will not be surprised to see this Louboutin on the red carpet this weekend! Glam mannequins in Marc Jacobs (left), and Michael Kors (right). I really loved the two looks by Marc Jacobs and Michael Kors. They seem like ensembles from the late 70s or early 80s, updated for today! A great look from Marc Jacobs for 2016. After I took these pictures I walked past Van Cleef & Arpels next door. Because it was night, they had taken the jewelry out of their windows, but this sign remained in one of them. In the windows of Van Cleef & Arpels. It was, of course, to honor the victims of the terrorist attacks in Paris in November. I am still thinking of them as the new year gets underway. I am glad Van Cleef & Arpels took the time to pay tribute to them and to the City of Light. I hope your 2016 is off to a wonderful start. I think we all need a little sparkle heading into January, thanks for sharing these lovely windows! Hi Deja! Are you in Paris right now? I will check your blog to find out. I LOVE that your friend wanted to go visit with Cartier jewelry! Whee! The Panthere collection always knocks me out. It makes me laugh that you thought of me. What a compliment! Those windows are exquisite.....a little fantasy and luxury to add sparkle to our day.